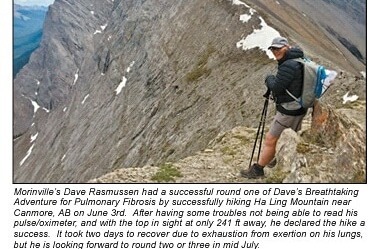 Update in the June 19 Edition of the Free Press – Morinville of my June 3 Hike up Ha Ling Peak. This is a fundraiser for an incurable lung disease called Pulmonary Fibrosis – The Restrictive Disease, that kills 5,000 people a year in Canada and took the life of my brother, Brian, in January 2017. Please consider making a donation so we can find a cure for this relative unknown disease.